Cairn Hill Nature Preschool has created a unique “hybridized” curriculum that is inspired by the principles of Waldorf and Nature-based education, and informed by the Common Core State Standards in the areas of English language arts, science, math, and the learning through the arts. We use the methods of Waldorf education to teach academic content in a hands-on, lively, experiential way, through real-life experiences. Children learn the rhythms and sounds of English through a large repertoire of beautiful songs and seasonal rhymes. These are embodied in accompanying movements/gestures and therefore easily learned. 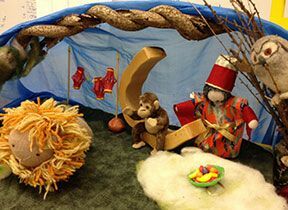 Stories and puppet shows rich in imagery and content are also a core part of the language arts curriculum. Exposure to such rich language builds children's speaking and listening skills--so important in later reading development. It enhances their vocabulary knowledge too. Learning the letters of the alphabet is easy and fun with Ms. Tara's mystery bag method! Children are natural scientists and so curious about our world. At Cairn Hill Nature Preschool science topics include soil, hibernation, solids and liquids, birds, crystals, and the water cycle, to name a just a few. Math concepts, such as counting, sorting and measuring are easily integrated into scientific study-- our nature setting provides the perfect context for both. The curriculum is based on the seasons and rhythms of nature that the children can observe around them. We spend time outdoors in nature and in the garden every day as part of our science and health curriculum. Research has demonstrated that active outdoor time fosters social-emotional development and autonomy. It also helps to develop the key learning skill of executive function, and can help in addressing attention deficit disorders​. Our gardening program involves children actively in the growing, harvesting and preparation of nutritious meals and supports the development of lifelong healthy eating habits. ​Every day, the children engage in art through painting, drawing, modeling and hand work such as finger knitting, felting and sewing. Art engages the imagination and develops fine motor skills. Long term studies of creativity show that it is declining among American students, and loss of play time is considered to be an important cause. In general, children's play time is being replaced by screen time. The children at Cairn Hill Nature Preschool spend considerable time in free play everyday. We believe such play stimulates their natural imaginations, enhances their creativity and helps to develop their social and emotional skills. At Cairn Hill children have the opportunity to develop all aspects of themselves and pursue their interests through a well rounded curriculum. An important part of the curriculum is rhythm and routine throughout the day which helps the children to feel secure, build self-confidence and anticipate what comes next. This develops a strong foundation for the child to grow into an engaged learner and a healthy adult.